Have you ever bought a piece of survival gear online only to be disappointed when it arrived? It’s really frustrating, right? One of the big problems I had when I was just starting out was telling good gear from the hype and more importantly how to tell a good website from a dishonest seller. Buying any type of survival gear is a constant challenge online. On one side you have the infinite variety of choice available. You can find ANYTHING you need online. On the other you have the near impossibility of judging the quality and practicality of an item without first getting your hands on it. For me, it resulted in multiple times where I bought something that looked good and had positive reviews only to have it to arrive and not make the cut. This may have been due to its quality, design, weight, or simply not delivering on promised features. Either way I now had an item that was used or opened and could usually not be returned. I had just wasted both my time and money researching and buying something that I could not use. Typically a prepper has to blindly make the choice between buying low cost “bargain” gear of unknown quality or spending lots of money on “top end” equipment. Both choices involve taking a risk. I am going to help you minimize this risk by showing you what to look for when buying survival gear online. Most survival gear can be divided into groups, it may be heavy vs light, expensive vs cheap, or do-it-yourself vs done for you. Knowing the general path you want to take is something you should learn when researching the gear you are buying. The first option I looked into was buying a basic bag with the main essentials in it. This is frequently a cheaper option as there is less gear included in the bag. However, buying a basic premade BOB can add on some extra leg work once you have gotten it to round out and tailor the loadout to meet your specific needs. This is a bonus to some people and can be a great option if they already have highly specific gear. It can also be a time saving approach for someone who has good survival knowledge and is comfortable choosing the additional gear that they need. The small basic items should come in quantities that are in the ball park of what you need for a 72 hour kit, instead of buying a pack of 100 bandaids when all you want is 5 for your bug out bag (BOB). The other option was to choose a bag that included everything I needed to survive. This option is best for someone who either does not have the knowledge or time to build their own bag. If you find the right bag you can meet all your survival needs in one, fell swoop. These bags are typically larger, heavier, and more expensive than the more basic bags. They also usually contain far more gear and a larger, better made backpack. There are some companies, such as Ready To Go Survival that provide the option to build your own custom bug out bag which they will then pack and send directly to you. This differs from many other companies that will just send you their standard kits that they have pre-chosen according to their own expertise and opinions. This custom BOB option is a great way to get all the gear you need from one place at a good price and is a third option to consider. If you are able to weigh the options of your gear you will be far more likely to end up buying something that actually meets your survival needs. When I was just starting out I failed to do this and ended up with a couple cheap premade BOBs that were nearly useless and caused me lots of frustration. Consider this as an investment of your time that will pay off when you end up getting the right gear the first time. This is far better than having to buy several types in order to find the one that suits you best. Carefully consider what survival problems you want to address BEFORE you buy your gear and you save yourself time, money, and grief. When looking for any gear educate yourself as to what THE BEST of that item look like. If cost isn’t your primary factor you can of course just go and pick out that one. But, if you are looking for a deal you will want to know what both a great item and seller looks like. With this knowledge, you will be able to quickly tell if a great deal you come across is worth investigating or a potential problem. Being able to identify quality gear and sellers will save you time, money, and headaches. Here is what I look for when researching any survival gear or online store. A site that is sourcing quality gear will want you to know by advertising the recognizable name brands that they stock. A site that sells true quality gear WILL NOT have the lowest prices in the world. Quality gear costs more to make because better materials are used to build it. This is true for anything from a tomahawk to a backpack. Most quality manufacturers enforce a Minimum Pricing Policy to encourage sellers to compete on factors other than price such as service and shipping. The result is that most name brand gear will sell at a similar price on most sites. For example, poor quality first aid kits do this by counting every band aid and wipe inside as a separate item where most reasonable people would count the first aid kit itself as 1 item. 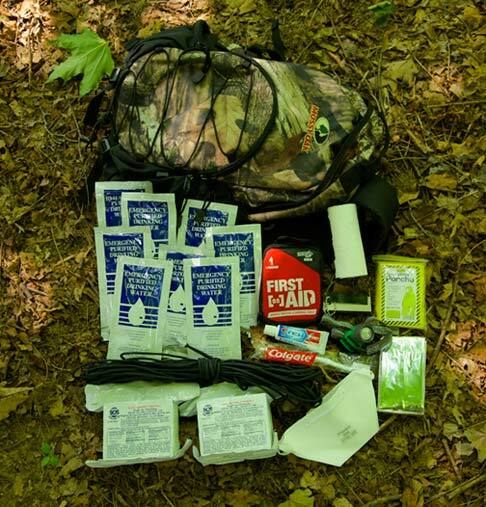 These 3 rules will help you when buying any survival gear online. Remember to figure out what options are important to you first to save yourself time, money, and frustration. Then look for the positive signs I mentioned in Rule #2 to find the right site to buy from. Lastly, if you end up on a site with any of the warning signs that I mentioned in Rule #3, keep on moving! Buying survival gear online doesn’t have to be a trial, once you have it figured out you will have the best gear possible to make your survival kit unstoppable! Do you have a nightmare story about buying survival gear online? What did you learn from it? What is your favorite place to buy gear from? Let us know in the Comments Section below, thanks! How Big and Heavy Should Your Bug Out Bag Be?